Don't know about you, but I've fully succumbed to a 100% digital lifestyle when it comes to the consumption of music (recent LP purchases notwithstanding). This really doesn't even involve compact discs any longer. Everything I listen to, it's on my phone. Yeah, my phone. Who would have thunk it, even a couple of years ago? I listen to upwards of an hour or two of music every day, and usually more. Much of this is done in the car, as I'm one of the unfortunate many who commutes a great distance to work. I've outfitted my chariot with an auxiliary hook-up that lets me plop the iPhone into a cradle and then run whatever comes out of it through my car's speakers. Perhaps you've seen, or yourself experience, such a get-up. It's life-changing, and totally has opened me up to entirely new ways of getting clued in about radical new sounds. 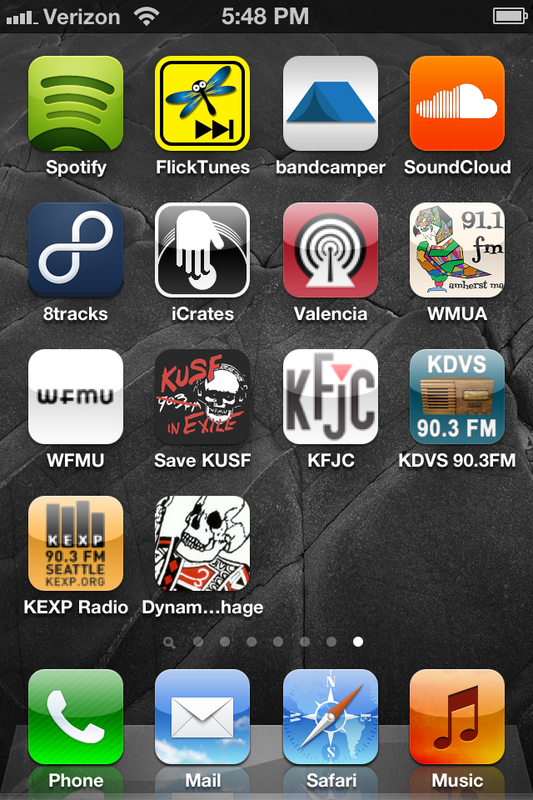 So I thought I'd pull together the music apps that I whole- or at least halfheartedly recommend for you. You'll probably heard of most of 'em. Granted, this is an iPhone conversation, so I apologize in advance to the Android or other OS users out there – though I'm pretty sure most of these are available for you, too. (If you're still rocking a StarTac or a Razr, I'm sorry, but you can click through my archives instead). SPOTIFY – Perhaps no application or service has so upended the way music is consumed and delivered as Spotify has, and in the US at least they're just getting started. I happily pay them ten bucks a month to listen to the app, ad-free, on mobile – in fact, I have never actually experienced Spotify as a "free" customer since I rarely use a PC to listen to music. The catalogs they pull from run incredibly deep, and often include brand-new independent 45s and LPs the week they're released. Not everyone's on there, but seems like 9 out of 10 things I hear about and want to try are easily found. The mobile app lets you store stuff for offline listening, kinda like you "own" it – which makes it easy to listen to in poor coverage or when you're off the wireless network entirely. And despite some grumblings from a few artists about meager paychecks, I'm glad to know that every song I stream deposits at least a couple of cents in the musicians' bank accounts. Totally essential app, and getting better every update. FLICKTUNES (now called CARTUNES) – This iTunes alternative could better be classified as a "public safety" app, as it's probably kept me from plowing my vehicle into those in front of and on the sides of me on numerous occasions. You know how when you're playing a song or even a downloaded podcast or radio show in iTunes, you're only able to "scroll" though a song – but not advance it 30 seconds forward or backward? I know – lame, right? That doesn't work when you're driving, even when your phone or iPod is mounted right in front of you there on the air vents. FlickTunes lets me use a "two-finger swipe" to easily advance 30 seconds in any song, which works especially well when I'm listening to a radio show and I don't wanna hear a particular song or songs. There are other cool features as well, but that one in particular is a lifeline both for me and the people who drive around me. 8TRACKS – I wrote about 8Tracks a couple of years ago here, and my enthusiasm hasn't diminished in the slightest. This is user-programmed and -curated mix tapes, effectively. It has attracted some incredibly knowledgeable experts across all sorts of sub-genres: 60s french pop; KBD-style punk; pre-WWII Latin music; C86 pop; female-created electronic music of the 60s; and loads of indie bands of every stripe. Even yours truly has a page full of mixes over there – and it works just as well, if not better, on your laptop. SOUNDCLOUD – At first it seemed like this site was all about people uploading field recordings of bird sounds & such, but music fiends being music fiends, it morphed into a hosting site for mp3 files. The difference between mp3 blogs of 2013 and those of, say, 2008, is that the latter truly gave away mp3s as downloads – I did it myself. Today, almost everyone posts them on Soundcloud, which makes artists happy and makes it more difficult for you to "acquire" a track without paying for it. It also means that, if you still follow music blogs, you need to click the little heart icon on the song that's been put onto Soundcloud, which then saves that song for you to listen to later. I'm always creating these playlists of songs I read about & listening later on SoundCloud. The app still needs to evolve a bit, but it's very useful & seems to be the place that mp3 uploads of all kinds have settled this past year. I'm even streaming my podcast over there. BANDCAMPER – Bandcamp became the platform of choice for independent artists to store their recorded music over the past 24 months, displacing MySpace entirely. It's 1,000 times better than MySpace ever was, which obviously isn't saying much. Bandcamper, an app that applies a "presentation layer" over the broader Bandcamp universe, has some gaping holes – searching for an artist whom you know is on Bandcamp can be incredibly frustrating if they're not found immediately. That said, once you find and "star" that artist or album or song, it's saved for you to stream anytime, anywhere. You're not able to pay for and download songs on this mobile app, but for try-before-you-buy, it's right up there with Spotify for overall utility. iCRATES – This really isn't a car app so is a bit of an outlier to the broader article, but it's a terrific app I just discovered a couple of months ago. iCrates is for those of us/you who still buy records and CDs, and who would like an aggregated peek into where you can find a particular piece on vinyl or a given disc. It looks into the Discogs and eBay databases and presents you with who's selling what, where. Far be it for me to do anything to hurt traditional record stores, which I love, but this is their worst nightmare. Now their used vinyl prices can be easily undercut with a quick search on iCrates for that same vinyl at a better price. Besides that, it's totally fun to mess around with, as it has the amazing Discogs.com database, with photos, right there at your proverbial fingertips. WFMU, WMUA, KFJC, RADIO VALENCIA etc. 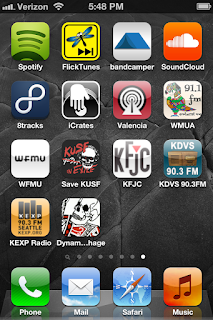 - Finally, there are the many college/pirate radio station apps. I recognize that there are aggregators like Tune-In out there that work really well, but I personally prefer an easy-to-see icon on my device that I can punch whilst driving. The best station apps start playing immediately upon launch, and provide song identification in big letters on the screen. WFMU's goes those one better, and not only streams all of their podcasts and show archives, but even lets you "favorite" individual songs so you can check up on 'em later (or buy them on iTunes if they're available there right now). I personally also enjoy the quasi-legit pirate station RADIO VALENCIA, along with college stations KFJC, WMUA (Erika Elizabeth's "Expressway To Your Skull"! ), KUSF IN EXILE, KEXP and KDVS. If there are others that you recommend, please let us know in the comments section and I'll check them out.